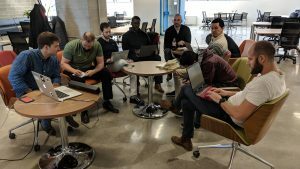 The definition of invest describes Week 8 at Hartford InsurTech Hub! Our investor network was extremely generous with their time describing how they use their venture funds. They provided key examples of successes, failures and what they look for. Many thanks to Andrew Pitz from Transamerica Ventures (NY), Gopi Rangan from Sure.Ventures (CA), Susan Holliday IFC (DC), Matt Pearlman from IA Capital (NY), Kenny Estes and Jeff Carter from West Loop Ventures (IL), Chris Downer from XL Innovate (CA), David Sack from Radian Capital (MA), Matt Kinely and Alex Whitney (IA), Mark Selcow from Costanoa Ventures (CA). The decision to invest is based on a broad spectrum of factors depending on the investor’s goals. Some investors may be focused more on a financial outlook in regards to revenue and returns, while others are looking towards the future and the ‘next big thing’. For insurance ventures, investors start with strategic alignment when looking to invest. When you are aware of the focus of the investor, you can adapt your approach and pitch. There is an importance of creating and investing in a good team: buyer dynamics are the question as to if they are going to buy and why they’re interested. Several organizations, and our mentors, give and devote time, talent and energy during the accelerator program to encourage, review information and provide leads. More than once a day, I hear a startup mention “my mentor helped me prepare for a sales meeting and it went really well”, “my mentor had a contact at a company I was trying to connect to” or “they reviewed my investor deck for me”. For all the free hours invested in these companies, the results are invaluable. Seth Rachlin, Chief Innovation Officer from Capgemini visited to discuss how they look to integrate startups into their practice and client companies. 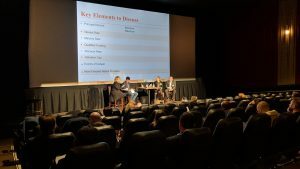 Along with Shiva Balasubramaniyan, they discussed how they invest time and resources to find the most applicable companies to support their insurance practice. Locke Lord sponsored the Take of Leave It mock Term sheet negotiation. Both our Investor and Startup founder handed over the authority of negotiation to Katherine Swan and Julie Mahaney to make sure their interested were represented well. If you missed our social, we have our livestream video on our Facebook. 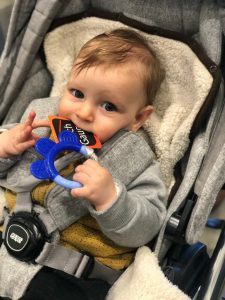 One of the largest investments any one of us will make is our children and we were lucky enough to have our youngest future startup visit this week- son of SkyWatch CTO. Pitch Gauge never missing an opportunity to market took advantage of the “babies and puppies” marketing adage. The team from EY came to discuss IPO and Exit Strategies. They discussed their team’s expertise in this process and their “exit platform”, which they invested 10 years in developing. The exit might be a strategic transaction or an initial public offering, EY can help the companies enhance value, avoid surprises and increase credibility. The method takes into account a series of variables and aligns them to a tailored action plan. Many thanks to Lindsay Long, Greg Martin, John Mallin, and Jennifer Scacco. Some of the startups attended a book signing this week as well. Robert Galbraith was signing his new book, The End of Insurance As We Know It, and some of the startups even received a free copy! We released the future trends of insurtech with our Trends report. Is your company investing the right resources to follow these trends? – click here to learn more. Key members of LIMRA including President & CEO David Levenson, our COO Gina Birchall and Kartik Sakthivel met with Mayor of Hartford CT, the Honorable Luke Bronin, and Michelle Cote, Director of Strategic Partnerships at Connecticut Center for Entrepreneurship & Innovation (CCEI) UConn to learn more about how we plan to become a core hub for InsurTech. 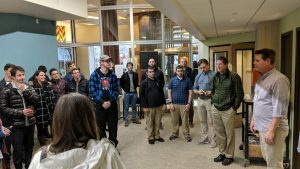 They also stopped by to the Hartford InsurTech Hub to meet with a few startups and gain a deeper understanding of the efforts. A Friday morning meeting with the State of CT insurance Commissioner’s office included the new Commissioner Andrew Mais, the Deputy Commissioner Joshua Hersman, and George Bradner, Property Casualty Director discussed how we can focus on futuristic ideas in our Hub! Regulators are investing time in learning and broadening their thought processes around InsurTech. Katie Wade, the prior insurance commissioner, gave her time and talent to discuss key regulatory issues one on one with each team as needed. Her years of regulatory expertise helped in a variety of ways with each company. Her passions in investment and the insurance community are strong! Ended the week with a tour of MakerSpaceCT, which is a fabulous investment in Downtown Hartford! Everyone should stop by to check it out. They officially open on April 15th.